September « 2013 « How Do You Measure 525600 Minutes? I finally broke down this morning and filed for unemployment. It’s been three months since I was notified that my contract would not be renewed and I had hoped I would have secured a new job by now. I have some good prospects but for now, the search goes on. I promised in an earlier blog to talk a little bit about what led up to my release. I’ve waited until now because I didn’t want my words to be fueled by hurt or anger. I finally decided I would rather do it in a positive way and give some advice that might help others who find themselves in similar situations. Rule #1 Don’t be too good at your job or know too much. Rule #2 When a superior says, “Don’t Worry” — watch out. Rule #3 Climbers don’t look down. They don’t have time for you. Rule #4 Open Door policies can get one slammed in your face. Rule #5 Keep records and be able to account for everything. Rule #6 Never feel that your job is secure. Rule #7 Change isn’t always good but don’t fight it. Rule #8 Learn to deal with incompetence. Rule #9 Don’t expect to be treated fairly. Even good people behave badly. Rule #10 Right doesn’t always win. Rule #11 Don’t expect rewards for loyalty. Rule #12 Rules (and policies) are made to be broken (and will be). Bonus– Rule #13 Work to live, don’t live to work. Holding a job and being successful at it, isn’t about showing up on time and doing what is expected of you. It’s not about your education or knowledge and expertise. It’s not about your dedication or going the extra mile. Those are all givens. To be successful, you have to be constantly aware of two things: company politics and money. You have to keep your eyes open and your ears to the ground if you want stay aware of what’s really going on behind the scenes. You, as an employee, are expendable. Simple as that. What makes you important is how you fit into the political and social climate of the workplace and what impact you have on the bottom line. — I’ll address and explain this set of rules, my experiences and their importance in future blog posts. It sounds simple enough and yet it is probably the hardest rule to follow. I have always struggled with this, even with jobs that weren’t necessarily in my main field of interest. It is too easy for many of us, to become so vested in our jobs that it’s hard to let it go when we punch out at the end of the day. Unless you own your own business– and even then, you have prioritize what is really important– living a good life and hopefully, sharing it with other people. Why do we work? To pay bills, provide for families, plan for the future… to live. Remember that the business doesn’t care about you. Unfortunately, in many cases, neither do employers. You may think they do– but if you step back and look at it clearly, you’ll realize you are there to perform a specific function. You are only one small ingredient in the recipe of success. Being responsible and taking ownership in your job is a wonderful thing. You have to learn to set limits. This is especially difficult when you are doing something you love. When work becomes the only thing, it’s probably time to move on. I personally have lost years of friendships, family gathering and missed opportunities to experience and enjoy life– either from the necessities of the jobs I’ve held, or by my own drive. You can’t buy back that time. You may find it necessary to put work first— but at what cost? I didn’t wave any flags this year or post any inspiring patriotic posts on Facebook or Twitter. In fact, for the most part, I tried to avoid social and new media coverage. It’s twelve years after the 9/11 attacks that claimed the lives of nearly 3,000 innocent people and the images of that day — the feelings of loss and mourning — are still fresh in my mind. Instead of letting others tell me how I should feel, remember or memorialize those events, I chose to grieve privately. I chose to focus on the memories of the lives that were lost, the families that were broken apart and the heroes that will not live to see another day. I chose to remember the husbands, wives and children whose lives have been forever altered by that single moment in time– loved ones suddenly stolen from them. Their lives will never be the same — our world will never be the same. In the days leading up to this anniversary, I heard people suggest that maybe it was time to move on. Tell that to families. Yes, it’s true that life goes on, must go on… but to suggest that we can, or should, put that day behind us, is not only insensitive but also ignorant and disrespectful. History repeats itself when we choose to forget. Last January, I was privileged to accompany a group of students to New York City and that visit included a visit to the 9/11 Memorial. A handful of those students had been in my play, September’s Heroes, a docu-drama surrounding the events of 9/11 in the fall of 2011. Even though we spent two months working, researching and then performing the play– I think it was still somewhat distant to them. Visiting the 9/11 Memorial brought that all together. Standing on that hallowed ground, realizing that the two massive pools were the footprints of where those two towers once stood and reading the names etched around those pools made it real for them. It was emotional. It was extremely emotional for me, seeing that link come together. It brought history to life for them– a moment in time that they were almost too young to remember. There are now school-aged children who weren’t even born when those towers fell. They need to know what happened. They need to know why we are talking about our rights to privacy, why there’s an ongoing war on terror and why they have to remove their shoes at airports. They need to know. We are the memory of those that were lost. We are the link to that moment in history that has led to significant changes in all our lives. Patti, Howard, Norm and Seth… and for an unexpected added bonus– Willie. First-names only. That’s what this cruise was all about, right? 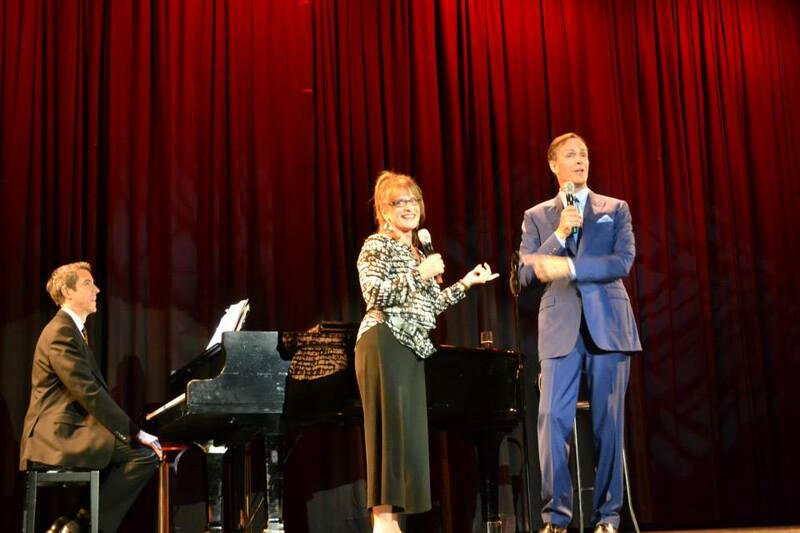 As if traveling in style and experiencing exotic locations wasn’t enough, we got to rub elbows with– and be entertained by– some of Broadway’s very best talent: Patti LuPone, Howard McGillin, Norm Lewis. 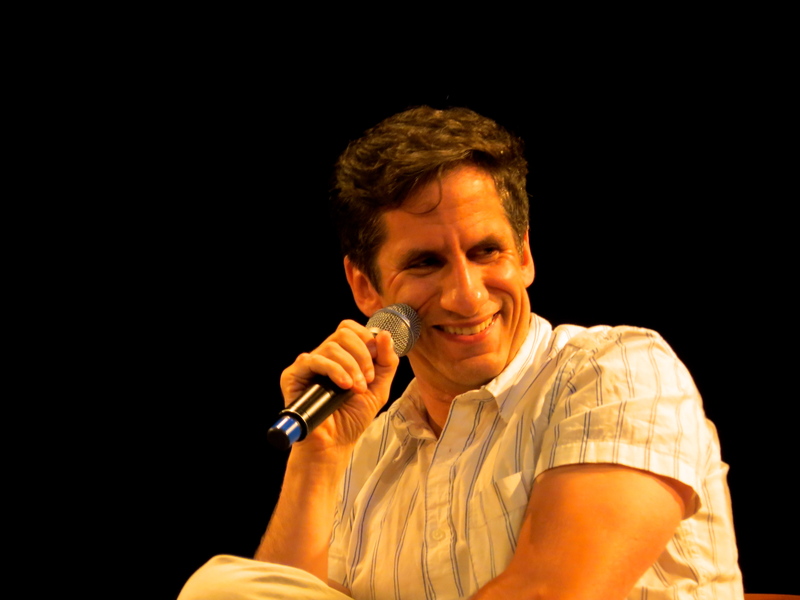 and arguably, the hardest working man in show biz, Seth Rudetsky. 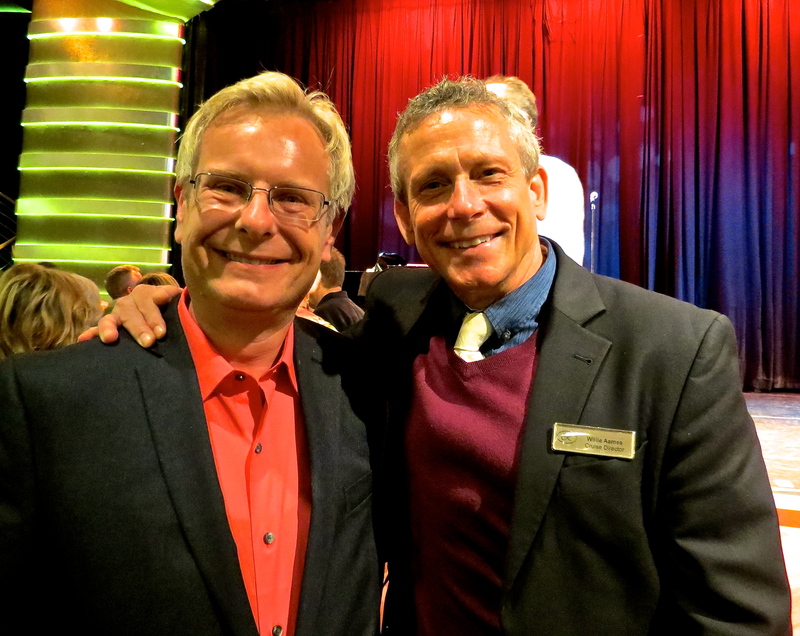 What a surprise to have Willie Aames as our wonderful cruise director! I certainly don’t want to leave out the brilliant composer and musical director, Joseph Thalken, who was the iciing on the cake. What a line up! Playbill, under the guidance of President & Publisher, Phil Birsh and Editor in Chief, Blake Ross; with the invaluable assistance of Judy Perl Worldwide Travel created a non-stop, thrill-a-minute dream vacation that we’ll talk about for years. 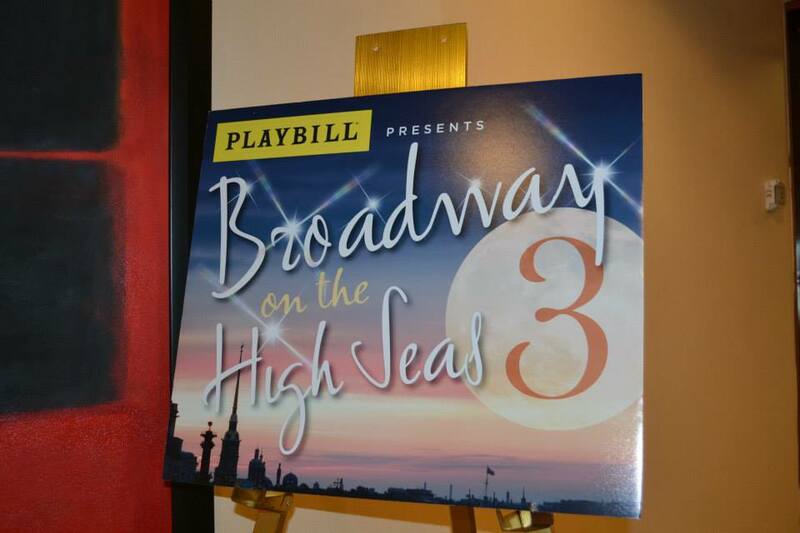 Broadway On The High Seas 3 was a hit! On top of our daily excursions, we had all the special Playbill entertainment keeping us busy, which is one of the reasons Michael and I barely got four hours sleep a night. But who could sleep!?! We were too busy having fun! 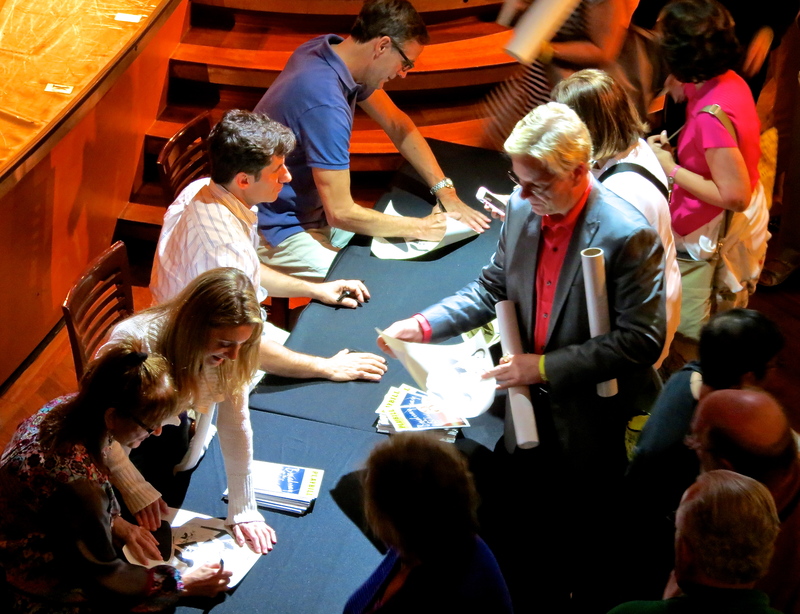 Shortly after we sailed on the first day, Playbill sponsored a Meet and Greet in the Constellation Theater. Of course, everyone was looking around to see if they could spot the Broadway folks. We immediately made some new friends and were busy chatting as they were about to start the welcome and introductions. In walks Patti and her husband, Matt… and they sat right in front of us. Now, I’m as starstruck as the next person. But, I also believe that ‘stars’ are regular people and deserve respect and privacy just like the rest of us. 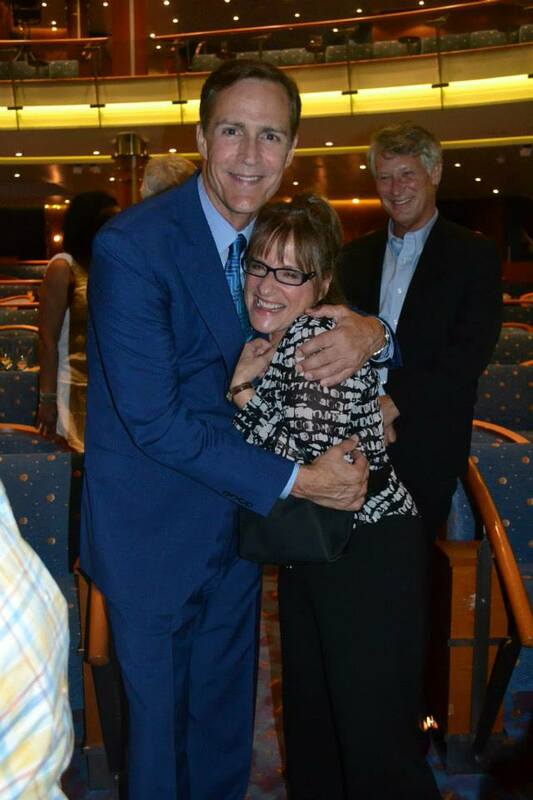 So even though I’d daydreamed for months about sitting and chatting with Patti for hours in the ship’s lounge (which sadly, didn’t happen)… and even though I could reach out and touch her… I didn’t approach her then. We did run in to her on the deck a few nights later and exchanged greetings and I was satisfied with that. If we were going to talk, I wanted it to happen organically. Besides, I probably would have made a fool out of myself anyway because I would have gushed… and gushed… and well, you get the picture. For me, Patti LuPone is one of Broadway’s greatest treasures and a true artist that completely embodies her craft. I know it’s cliche but it was an honor just to be in the same room with her. After introductions of the staff and entertainers, everyone went back to socializing and I took the opportunity to introduce myself to Blake (the editor at Playbill), and thank her for allowing high schools to use the Playbill cover for their show programs. (We used it for Joseph this past April.) This got us talking and she introduced us to Phil ( the president of Playbill) and we chatted about the exciting things Playbill is doing to expand its reach. It was really nice making those connections– and I have to say, Blake totally reminds me of Carrie Bradshaw in SITC. She’s adorable. We also met our travel agent, Judy Perl and her husband and had the chance to thank her in person for setting everything up for us. If you haven’t been following the blog, Judy set up a private tour of Stutthof for us– and then her family joined us on the tour which was really nice. I’m looking forward to working with her great company when we travel in the future. 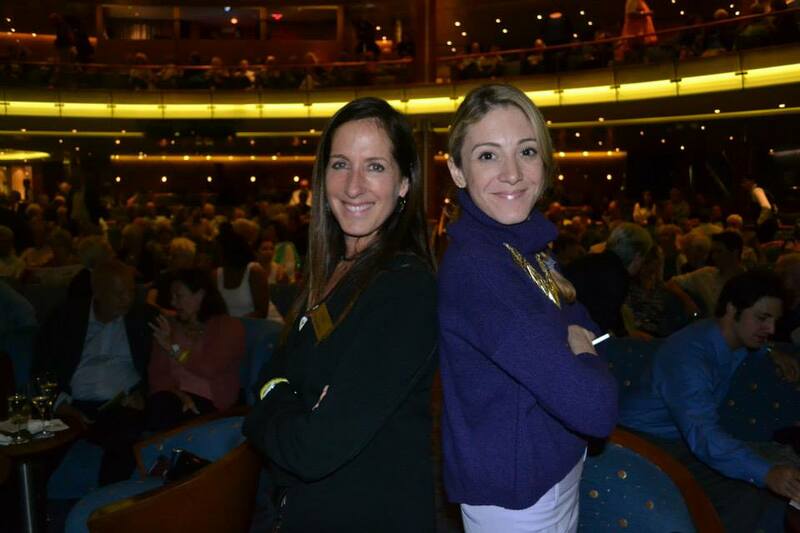 The second night was Patti LuPone’s big concert. It doesn’t matter how many times I’ve seen her perform, I always marvel at her technique and artistry. She gave us her Coulda, Woulda, Shoulda show — and according to Phil afterwards, the longest concert of any performer on the BOTHS cruises so far. Patti gave us an amazing set of songs from parts she “Coulda, Woulda, Shoulda” played, with a mix of songs from parts she did play, including Meadowlark and Don’t Cry For Me Argentina. She also sang, I Get A Kick Out of You, seeking out her Anything Goes co-star Howard McGillin and serenading him in the audience. The concert only ended after a standing ovation and three encores. I was so invigorated, I barely slept that night. 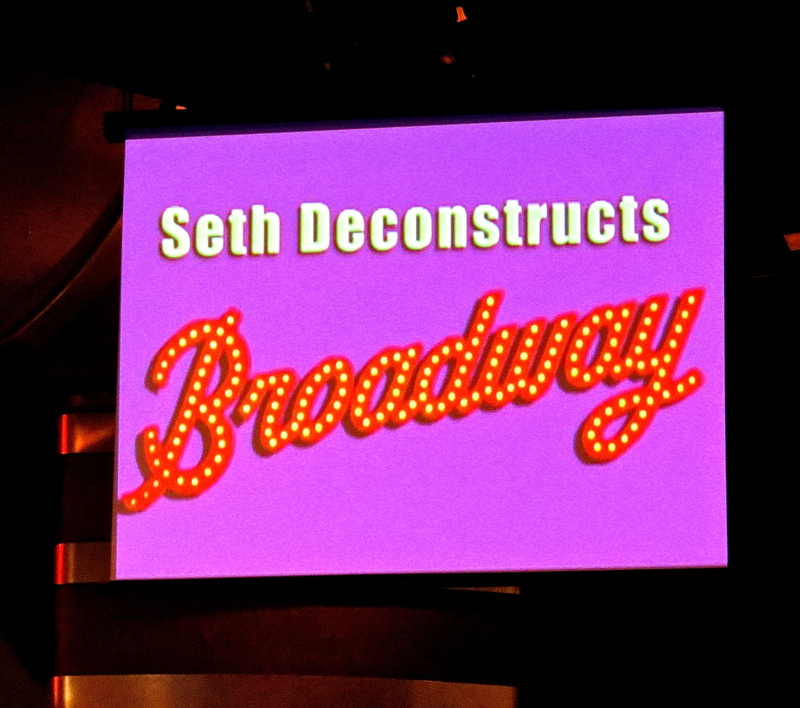 Tuesday night, Seth Rudetsky entertained us with his amusing and insightful, Deconstructing Broadway. Seth is an amazingly talented performer, writer and musical director among other things. I’m not sure there’s anything he can’t do. Best of all, he’s an energetic, funny guy that loves all things Broadway. Among other things, he entertained us with his hilarious comparison of Patti and Madonna’s Eva Perons in Evita. Guess who won? After two days off, with night excursions in Saint Petersburg, Seth was back Friday night, interviewing Broadway’s longest running Phantom, Howard McGillin, for his informal, Chatterbox. There were lots of great stories (including passing on Into the Woods) and Howard sang, A Man Could Go Quite Mad from his role in the original cast of The Mystery of Edwin Drood. 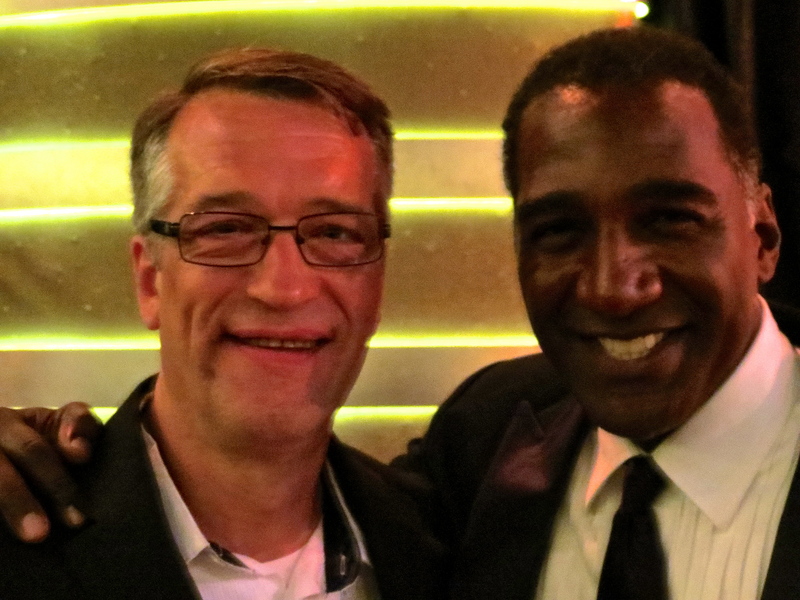 Saturday night’s entertainment was supposed to start out with Seth’s Chatterbox, interviewing Norm Lewis, only Norm had to leave the ship a couple days in to the cruise, fly to LA for a shoot on the TV series, Scandal, then fly back to rejoin the cruise– only he missed a connecting flight. So we had the bonus treat of two interviews with Patti. She’s certainly had a roller coaster-ride of a career and has many great stories to share. After dinner, we were treated to Howard McGillin’s big concert. I really love his voice and could listen to him for hours. One of the highlights of his show was bringing Patti onstage to recreate their number, You’re the Top from Anything Goes. I’d been fortunate enough to see them do it originally on Broadway (twice), so that made it extra special for me. This was the first time they’ve had the opportunity to perform together since. It was a really great concert. Sunday, Norm made it back on the ship in the afternoon, shortly before we left Lithuania. With all the travel and jet lag, they scheduled him for a massage and I happened to be in the spa at the same time and got to chat with him. He’s a super nice guy. Late that night, Playbill had scheduled Broadway After Dark, which, after a misguided game of Broadway bingo (I shouted BINGO first Seth! ), it luckily became a Chatterbox with Norm. It turns out he grew up about 20 miles from me and is only a couple months younger than I am. He ended the interview by singing, Rain from Once On This Island, which was absolutely incredible! 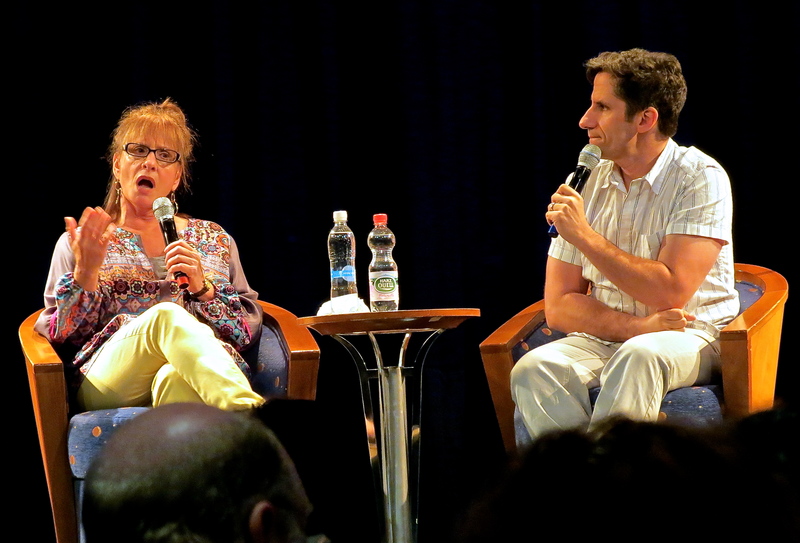 Seth’s Chatterbox with Patti LuPone. Monday, Seth continued his interview with Patti and we were treated to two more songs. It wasn’t until then that I realized I’d never heard her sing, I Dreamed A Dream, live. She won the Oliver Award in 1985, for her performances in both Les Miserables and The Cradle Will Rock. Patti brings such depth to the song. She also wowed us with Buenos Aires from Evita. 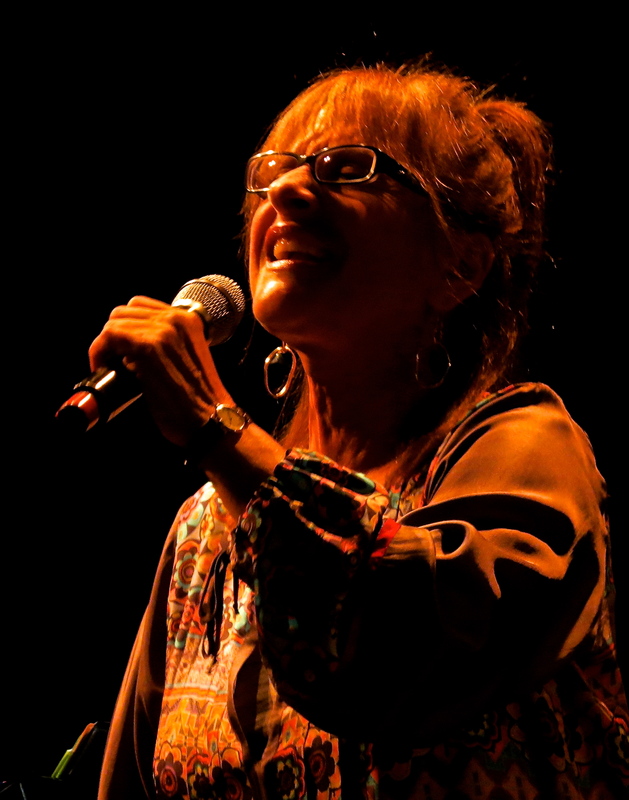 Patti LuPone singing Buenos Aires. 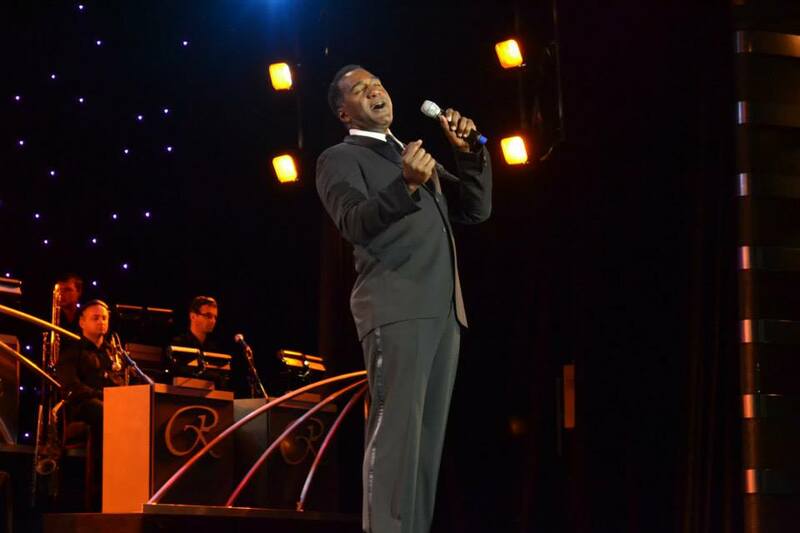 After dinner, everyone was blown away by Norm Lewis in concert. What a voice and a great showman! It was the perfect way to end the Playbill portion of the cruise. We’d just seen Norm on Broadway recently in Porgy and Bess and he’s simply phenomenal. Toward the end of his concert, our cruise director, Willie Aames, joined Norm on stage for a duet and the crowd went wild. After Norm’s concert, we celebrated the end of the cruise with one last toast. Michael and I got to chat with Willie briefly and thank him for making our stay of the Regent Seven Seas Voyager so memorable. We actually still had one full day in Germany ahead but because our luggage had to be packed and outside our room that final night; the Playbill events ended a night earlier. This way, everyone got to dress up and there was no rush after the evenings festivities to get packed. I forgot to mention that when we first got to our rooms, we had swag waiting for us. We received canvas Playbill bags that among other things, included a special edition print, especially for BOTHS3 that we were able to have signed by all the performers. I thought it was really a nice touch. Playbill did an excellent job planning out this adventure. They kept us going non-stop for ten days, yet we were never rushed and still managed to have a little free time. Patti, Norm, Howard and Seth were frequently out and about, went on some of the tours and were often accessible. I also really appreciated that we got daily updates of the Broadway events delivered to our room so we wouldn’t miss anything. Michael getting our limited edition prints signed. Unfortunately, Michael and I won’t be able to go on the BOTHS4 (Tahiti) but 5 and 6 are already in the works and we’re making plans. Broadway On the High Seas is the perfect way to see the world and get a more intimate Broadway experience all rolled into one vacation. 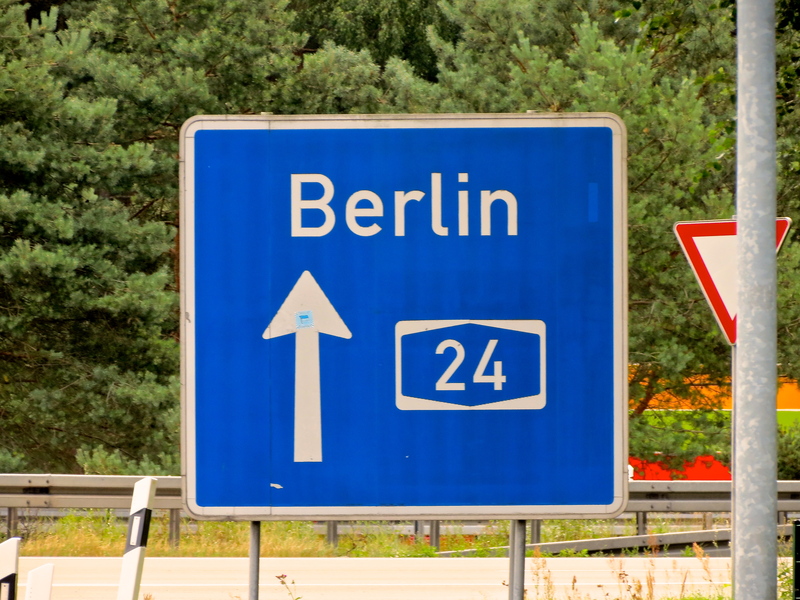 From the time I first thought about wanting to travel abroad, I wanted to go to Berlin. Of course my problem has always been that because of Christopher Isherwood’s The Berlin Stories, I wanted to visit 1920-30’s Berlin. Obviously, time travel isn’t possible– but Isherwood’s vivid portrait of the decadent cabaret and underground scene have always spoken to me. I was more than content to have this opportunity to get a glimpse of this captivating city– with, or without the dark undertones that have marked its history. Even, if it meant six more hours of bus travel to do it. We started our day by getting on a bus at the port in Warnemunde, Germany for our three hour ride to Berlin. The trip was marked by the beautiful countryside and farmland, a brief bathroom stop and hundreds of wind turbines producing green energy. 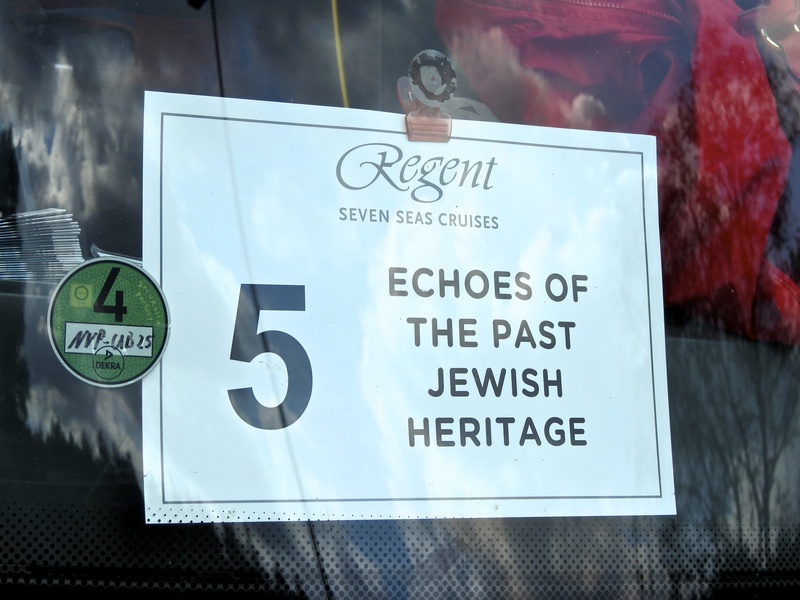 I think I managed to get in a short nap and I was all set for our tour, Echoes of the Past: Jewish Heritage. 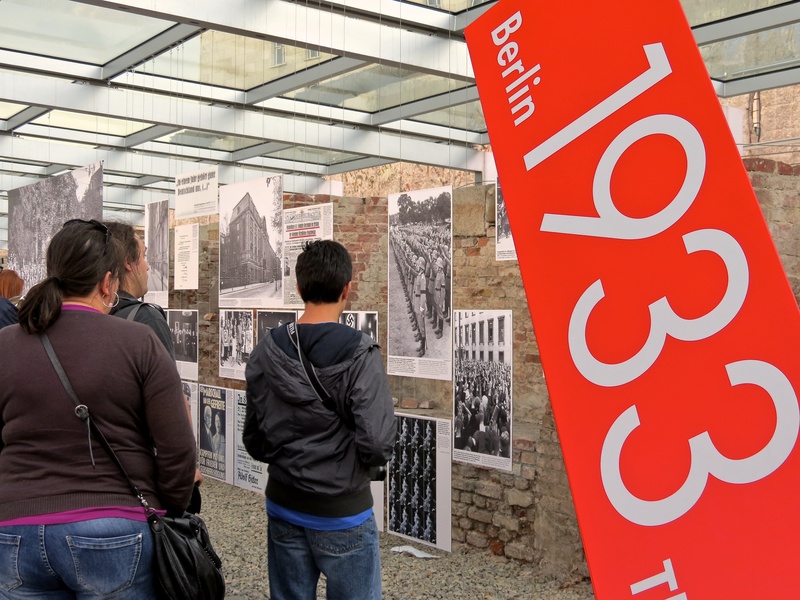 Of the three different tours of Berlin, we thought this one would be the most interesting, considering it would also compliment our visit to Stutthof the previous day. I was also hoping to gain a clearer picture of the current German perspective of World War II. A close up of the Reichstag Building. 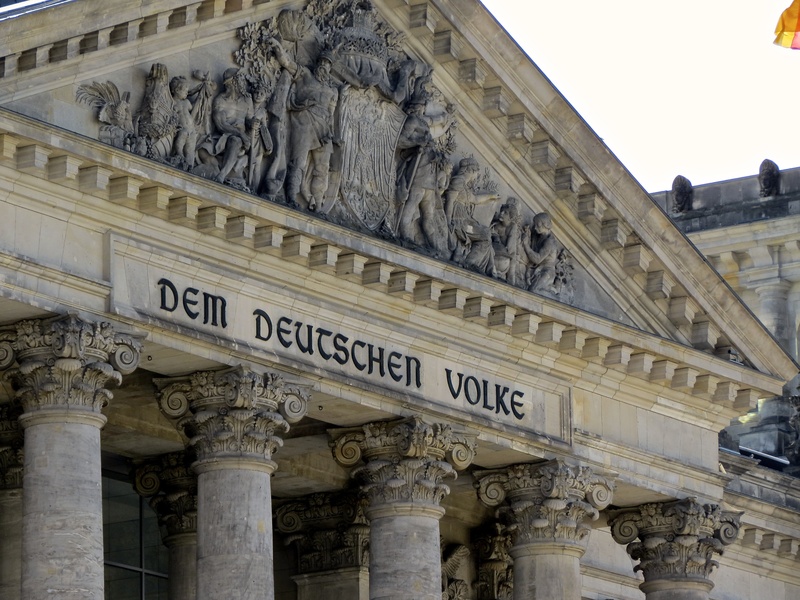 When we reached Berlin, we stopped to meet our tour guide and he took us to the Reichstag Building first. 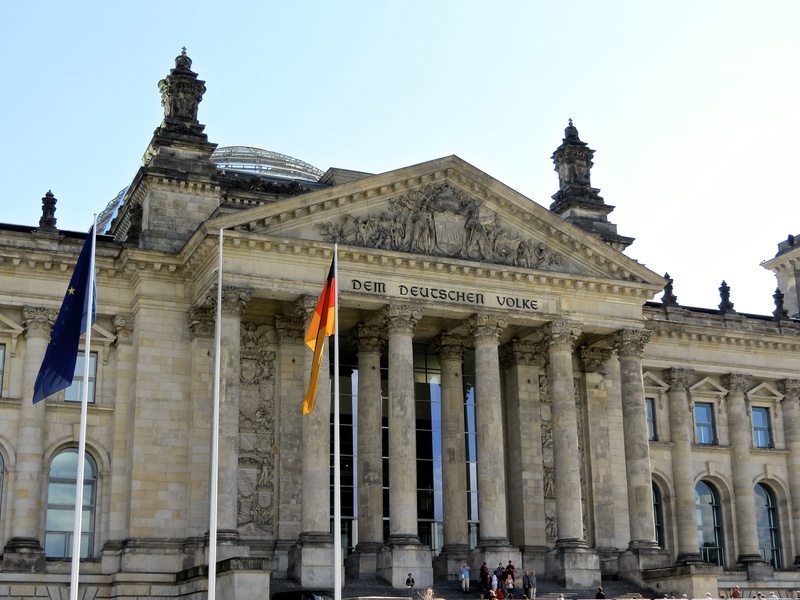 The Reichstag is the home of the German Parliament. A monstrous building built in the late 1800s, it mysteriously caught fire in 1933 , the same year power was given over to the Nazi party there. Damaged, it was mostly used for military purposes during the war and was a central target of the Red Army during the Battle of Berlin in 1945 for symbolic reasons. The historic Reichstag Building, home of German Parliament. It sat for years in disrepair, was almost torn down and served a variety of uses before being fully renovated in the late 1990s when the parliament returned to its former home. 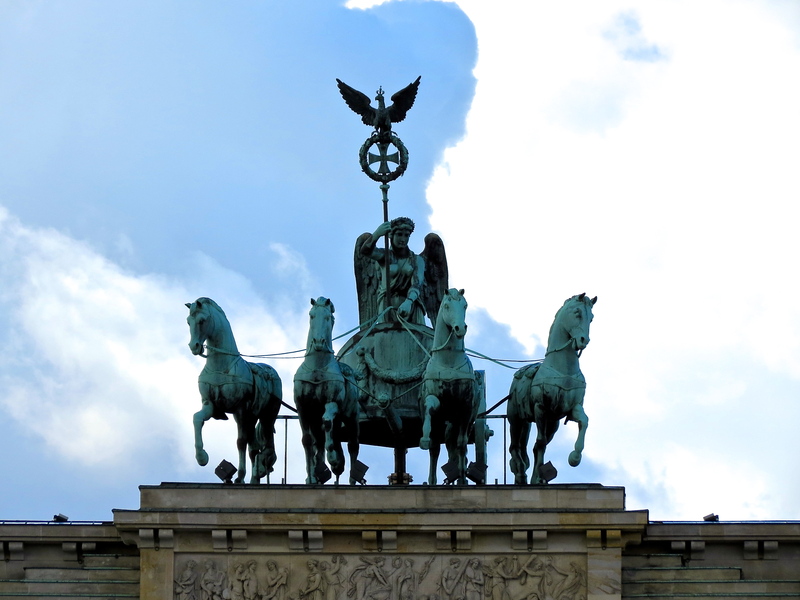 The top of the Brandenburg Gate. 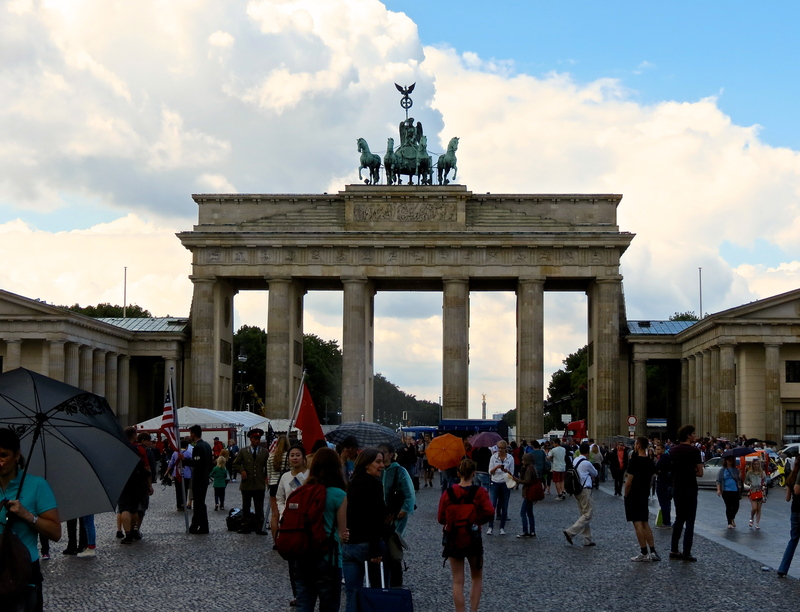 Then we proceeded to the Brandenburg Gate. One of the most known landmarks in Germany, it was constructed in the 18th century and is considered an important symbol of Germany. It stands at the west center of Berlin. 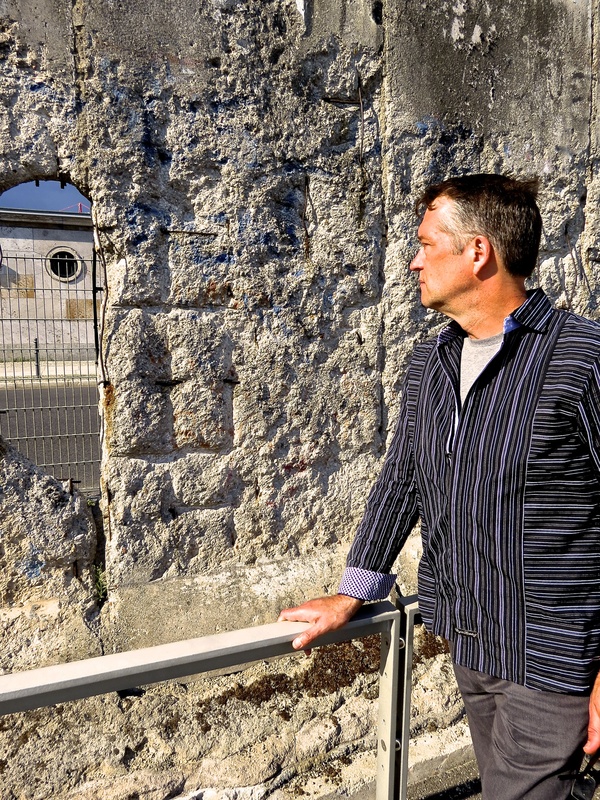 While the Berlin Wall stood, the gate was isolated and inaccessible. So when the wall fell in 1989, there was much celebration and focus surrounding the site. The rest of our morning was spent at the Jewish Museum, Berlin. 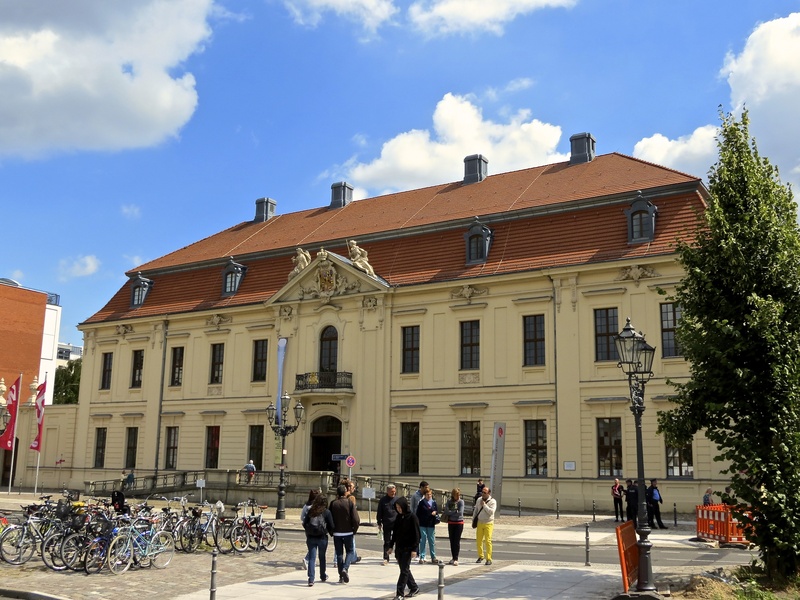 The museum is housed in two buildings and is only accessible by an underground passage from the old Berlin Museum. 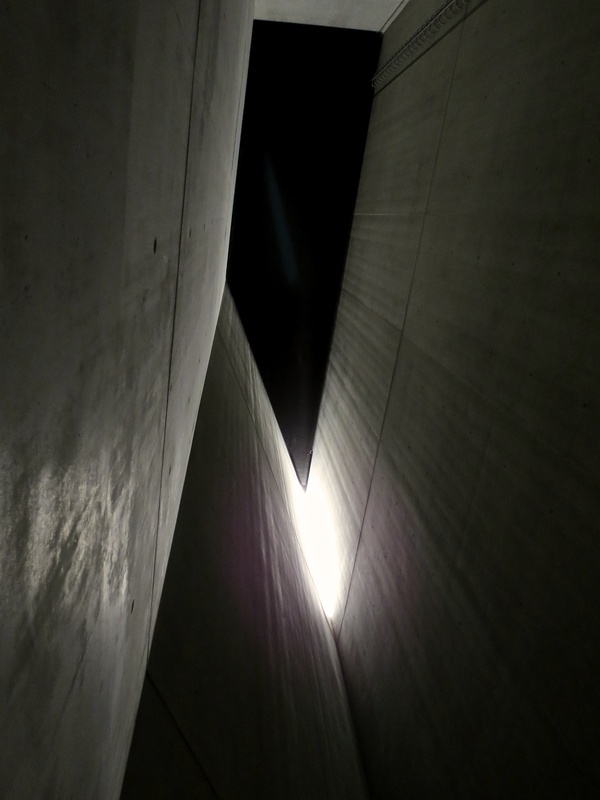 Designed by architect, Daniel Libeskind, the museum zig-zags though spaces, including vast voids, housing permanent and special exhibitions of German-Jewish history. 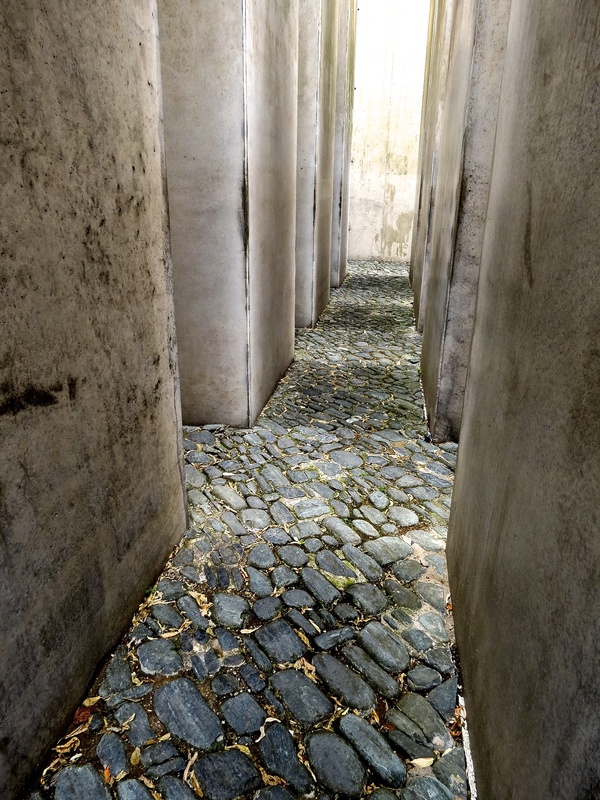 There are three particularly large spaces, representing the Holocaust, that are meant to be experienced. 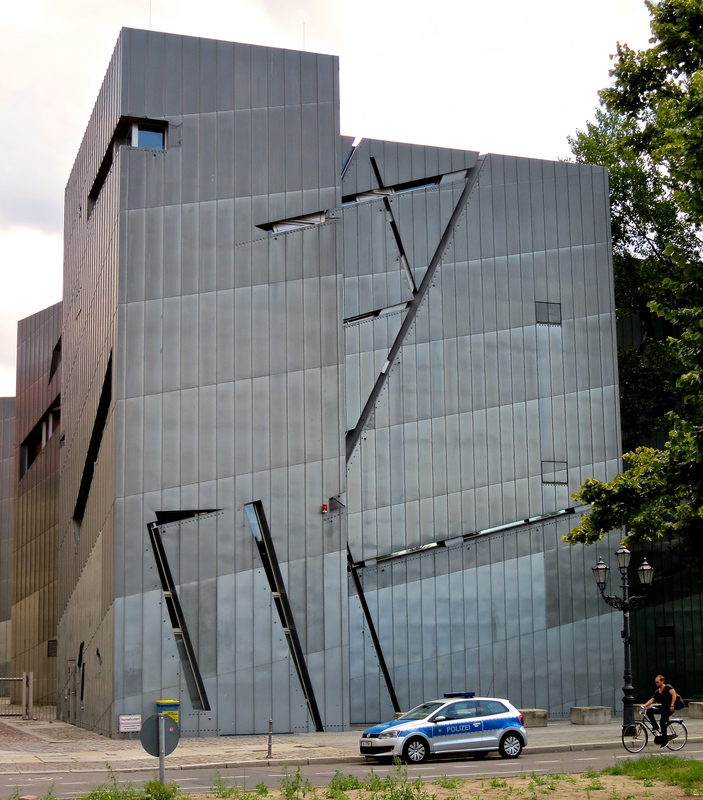 The Jewish Museum, Berlin, designed by architect Daniel Libeskind. The first space we visited was the Garden of Exile which attempts “to completely disorient the visitor. It represents a shipwreck of history.” (Daniel Libeskind, 1999) When you first look at it up close, and as you start to walk through it, it appears to be very straight and vertical– but you soon find yourself stumbling, almost dizzy and disoriented through the maze. From the outside of the museum, as we were leaving, we could see the extreme angle and tilt of the garden in comparison to the level ground that created this feeling. Walking through the Garden of Exile in the Jewish Museum, Berlin. Inside the Holocaust Tower. Notice the ‘ladder to nowhere’. Then we went in the dark, chilling Holocaust Tower. 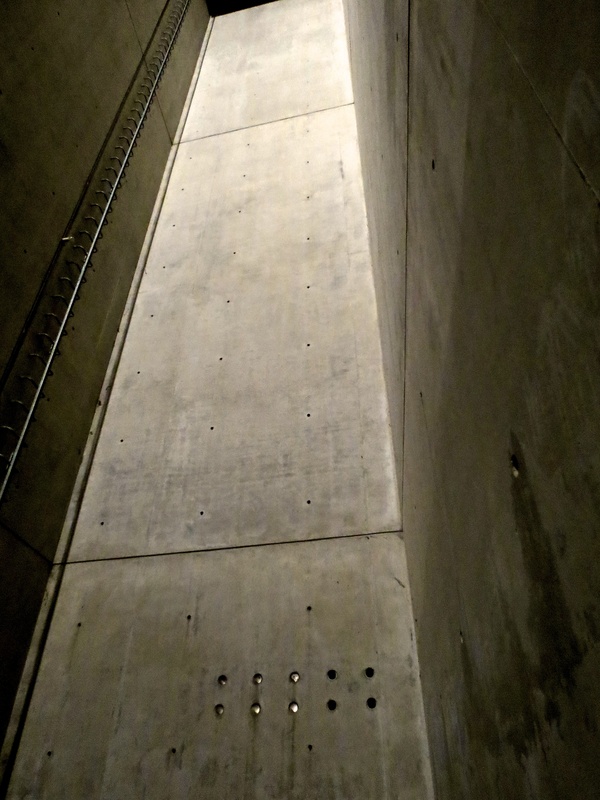 It is a 79 foot high, bare concrete tower with only a small shaft of light entering through the roof. There is a metal ladder on one wall, far above your head. Unreachable. It appears to go to the top– a possible escape… but it doesn’t quite reach the blackness of the ceiling. The feeling of the space is cold, dark isolation, with no way out. Looking up inside the Holocaust Tower. 10,000 faces in the Shalekhet- Fallen Leaves exhibit. The third space was the only area of the Libeskind ‘void’ that could be entered. 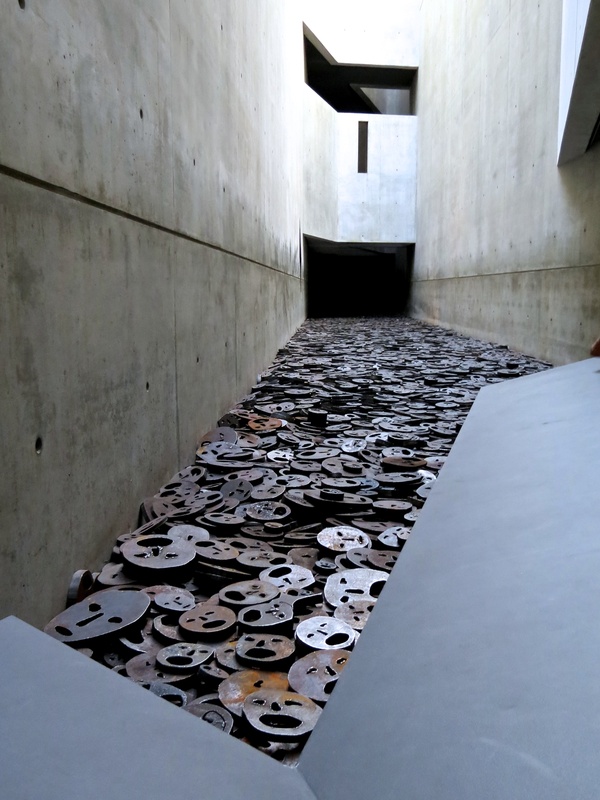 Shalekhet- Fallen Leaves designed by artist, Menashe Kadishman, consists of 10,000 faces punched out of steel. They are scatter on the floor of the “Memory Void” and visitors are encouraged to walk on them. 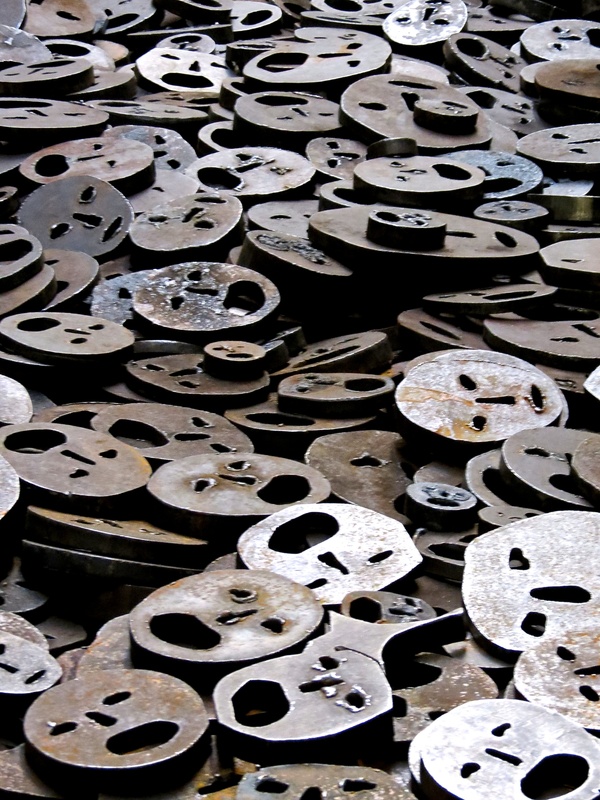 The artist intended them to not only represent the victims of the Holocaust (Shoah) but dedicated them to all victims of war and violence. Inside Libeskind’s, “Memory Void”. The exhibit, Shalekhet- Fallen Leaves. 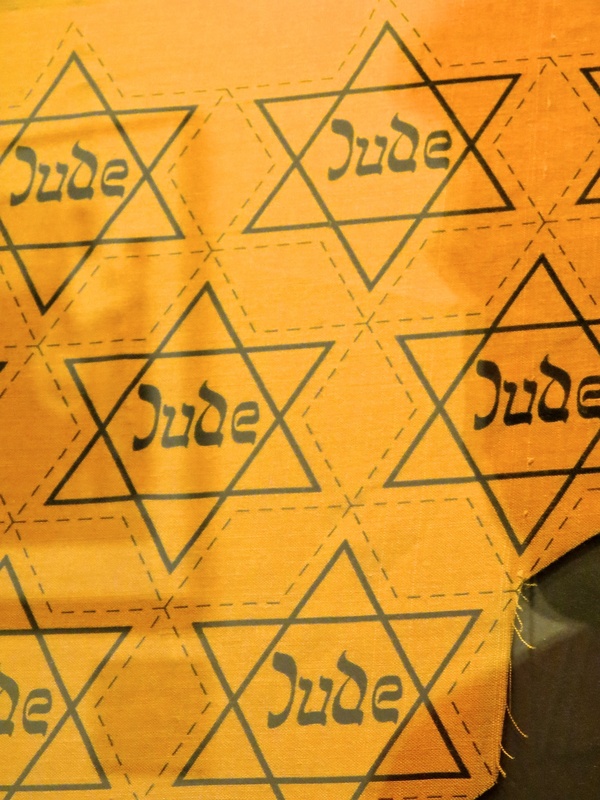 On exhibition, the Star of David, all Jews were forced to wear as identification by the Nazis. Through the main museum, you had to go to the top to enter the exhibition rooms. Then like a maze, you walked through Jewish history, with only one way out as you made your way to the bottom of the museum. Michael and I explored most of the museum on our own, leaving the group behind so we could go at our own pace. We had lunch in the courtyard of the museum and a short break to wander down the street before the tour continued. 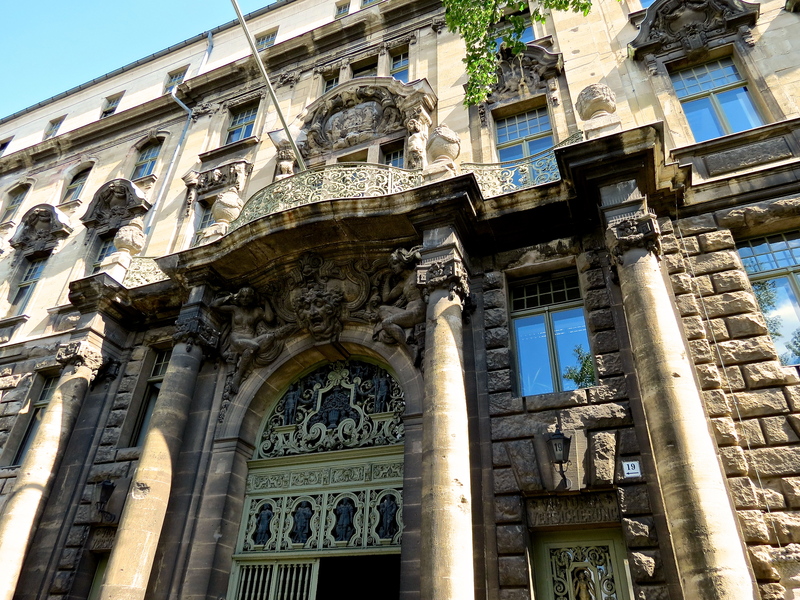 This rather ornate building next to the museum is now an apartment building. Next, we visited the Holocaust Memorial named, The Memorial to the Murdered Jews of Europe. It was designed by Peter Eisenman who described its design as to produce feeling of uneasy confusion and represents an “ordered system that has lost touch with human reason”. It consists of 2,711 concrete slabs of varying heights, on a grid pattern of unlevel ground. 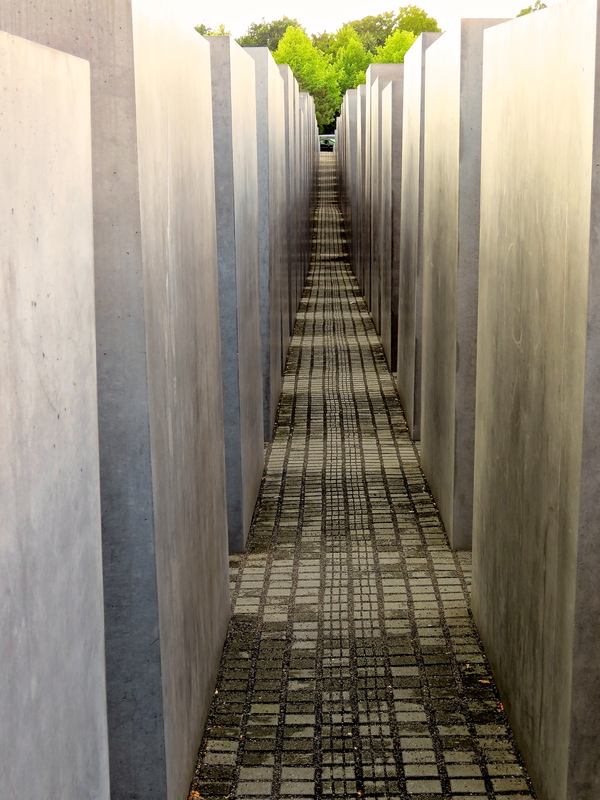 The Memorial to the Murdered Jews of Europe in the center of Berlin. The English pamphlet, though, states that there is no intended symbolism. Inside the grid of the Holocaust Memorial. Our tour guide said that he believed the intention behind the design was to allow visitors to envision their own meaning based on what experiences, or desired meanings they intended to gather from visiting the memorial. Below the memorial, underground, is a vault with all the known names of the Jewish Holocaust victims. The first thing I saw when we approached, was a large cemetery. 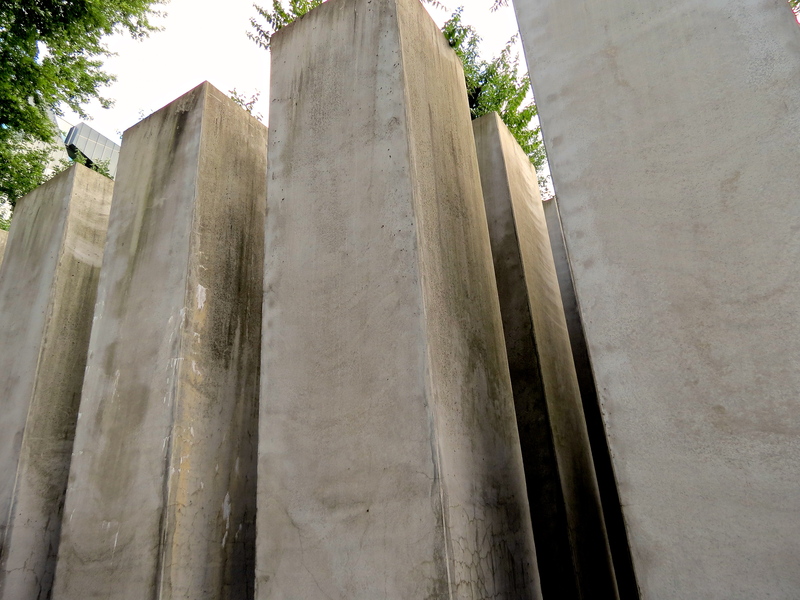 The outer stelae (slabs) are lower to the ground and as you walk through the memorial, you become engulfed, with the stelae towering over you in height. I couldn’t help but notice its similarity to the Garden of Exile at the Jewish Museum. 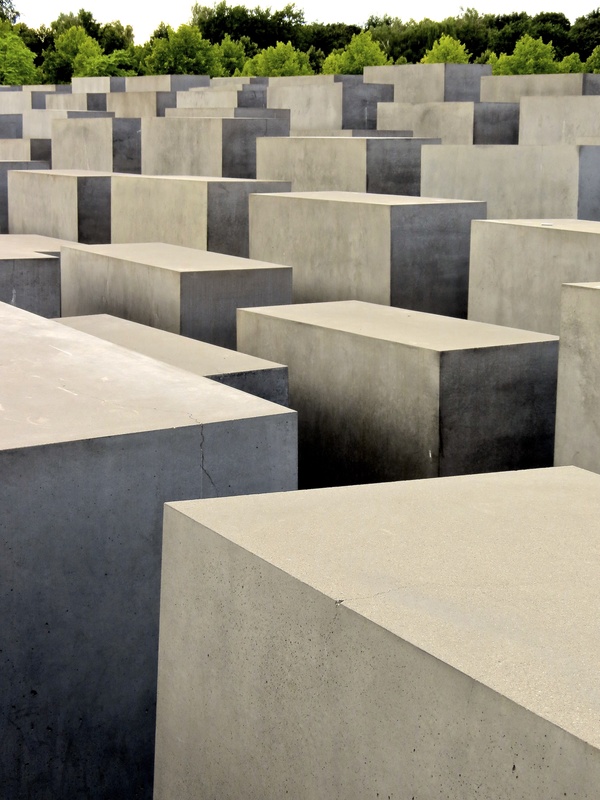 A big controversy arose over the memorial because it only recognized the Jewish victims, leading to memorials for other war victims being erected throughout Berlin. Our next to last stop in Berlin, held two important exhibits. One of the few standing sections of the Berlin Wall and below and beside it, an indoor/outdoor exhibit, Topography of Terror. Topographie des Terrors stands on the site where three buildings used as headquarters by the SS and Gestapo once stood. The buildings were largely destroyed in 1945 by allied bombing and the rest demolished after the war. Only part of the foundations remain. 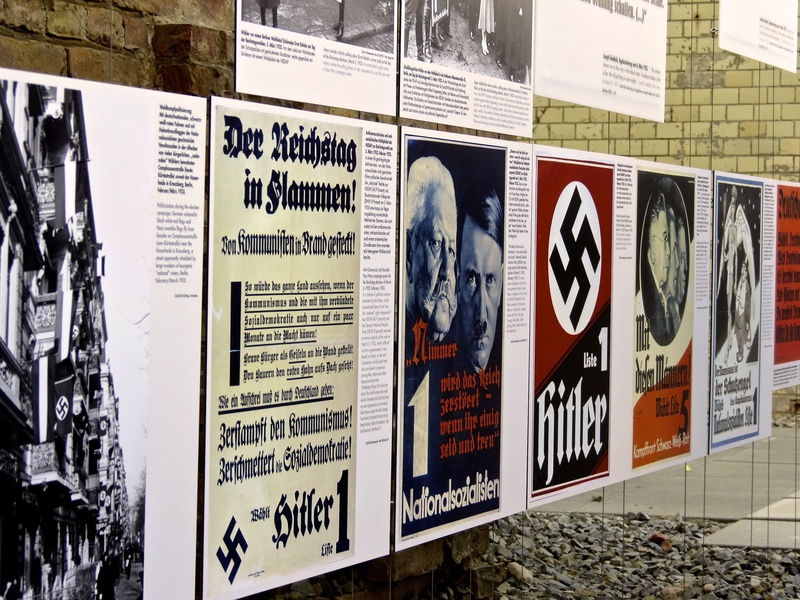 Against those foundations, stands the outdoor exhibit which focuses on the events of the year 1933 when the Nazi regime came into full power. Topographie des Terrors and behind it, the remaining walls of SS and Gestapo headquarters. It’s a great exhibit and I’m really glad I got to see it. I found it really powerful and moving, especially having been to the concentration camp the day before. It was like taking a step backwards and seeing where (and how) it all began. The Berlin Wall. 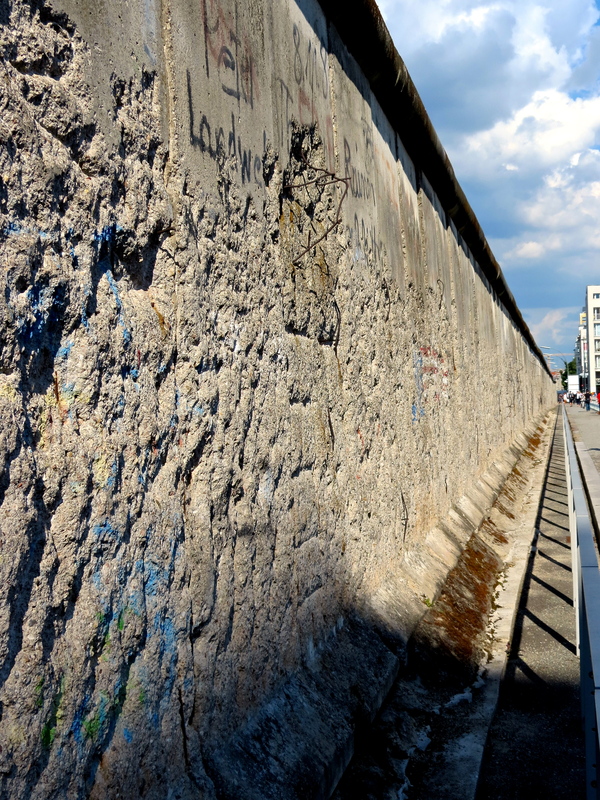 As an average person, of my age, witnessing the changing world history– The the fall of communism, the tearing down of the wall, the reunification of East and West Berlin– it was an important moment in my life. The images from the original media coverage are engrained in my mind. I remember talking to a friend, shortly there after, who was in Germany with a touring show at the time, who was lucky enough to be there as it happened. I remember how jealous I was that they were present at that important moment in history. 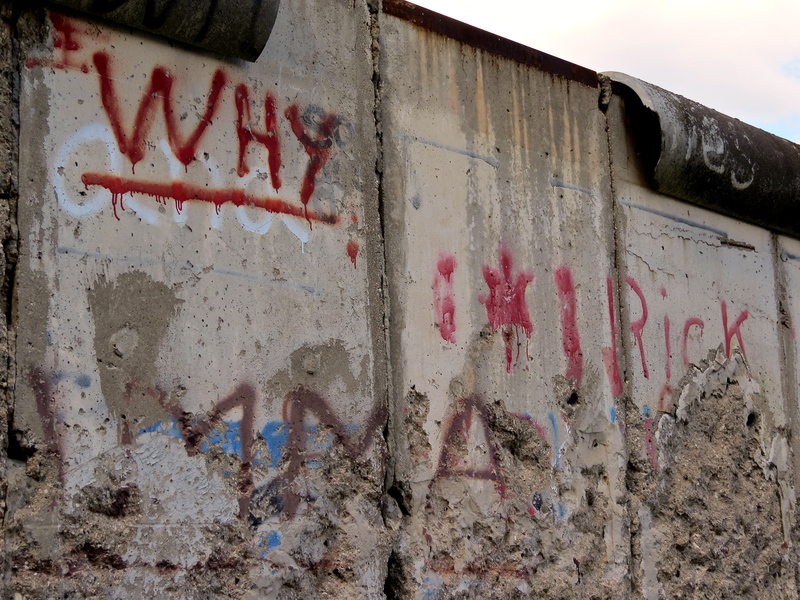 “WHY” at the Berlin Wall. The wall itself, is not that threatening. It’s a very thin concrete wall. It is the symbolism of what it represented and how it affected so many lives that’s important. Our tour guide recounted his experience when the wall came down: Friends were calling him in the middle of the night but he didn’t believe them. Finally he heard the reactions of people in the street and realized it must be true. An aunt of his that lived on the other side (I don’t remember who he said lived in East and West Berlin), showed up at his door the next morning, suitcases in hand. She brought with her, all her important belongings because she was afraid the freedom to cross the line wouldn’t last and she would be separated from them again. They had been separated for years. Looking down the length of the remaining piece of the Berlin Wall. So I was finally here. I was staring at this insignificantly simple structure that represented so much heartache and political control of people for so long. I was finally able to link my own personal recollections– my history– in this very spot, which was a very important moment in time for me. My moment at the Berlin Wall. I could go on a tangent here about the evils of war, political control and the horrific events that have ruined so many lives of average people (Look at what’s happening in Egypt and Syria today.) But I won’t. I was content. No, exhilarated to be here and see this first hand. It started to pour just as it was time to get back on the bus. We had to run through the rain to keep from getting totally drenched. 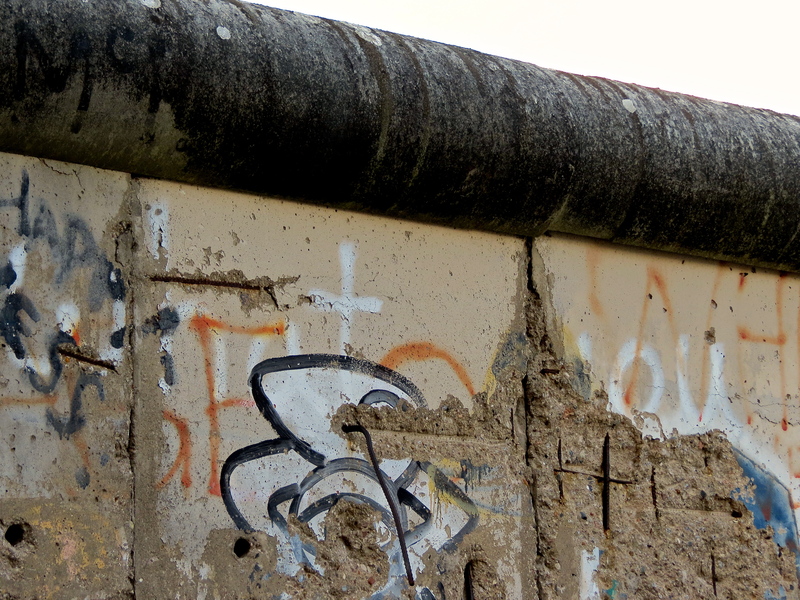 I suddenly realized, though we’d seen a lot, I was a little disappointed with our visit to Berlin. We still had one more stop before heading back to the ship– and then I looked out the window and we were suddenly driving through the shopping district. There’s no other way to put it, it was simply amazing! Blocks and blocks of tree lined streets shading nearly every designer shop you could possible think of– it was a shopping mecca. Beautiful! It made me want to go back before we’d even left. 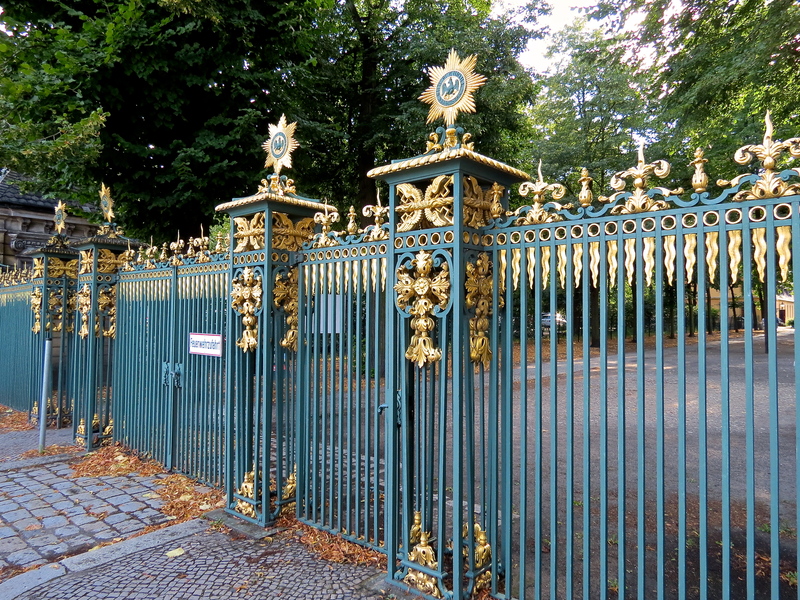 Ornate gates at the Schloss Chalottenburg. Our last stop in Berlin was the Schloss Charlottenburg (Palace). We didn’t have much time here except to walk around the front courtyard and statue of Friedrich Wilhelm I. It was built at the end of the 17th century and later expanded. I wish we’d had time to tour the inside and the incredible gardens on the other side of this massive palace. 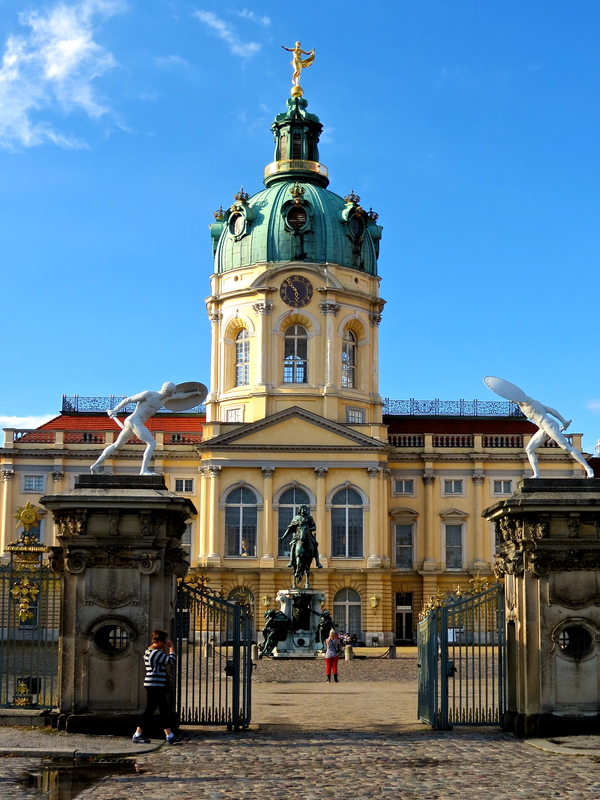 The stunning Schloss Charlottenburg in Berlin. I guess I’ll have to put that on my list for things to see the next time I’m in Berlin.